For other uses, see Bering Strait (disambiguation). The Strait has been the subject of the scientific hypothesis that humans migrated from Asia to North America across a land bridge known as Beringia when lower ocean levels – perhaps a result of glaciers locking up vast amounts of water – exposed a wide stretch of the sea floor, both at the present strait and in the shallow sea north and south of it. This view of how Paleo-Indians entered America has been the dominant one for several decades and continues to be the most accepted one. Numerous successful crossings without the use of a boat have also been recorded since at least the early 20th century. Since 2012, the Russian coast of the Bering Strait has been a closed military zone. Through organized trips and the use of special permits, it is possible for foreigners to visit. All arrivals must be through an airport or a cruise port, near the Bering Strait only at Anadyr or Provideniya. Unauthorized travelers who arrive on shore after crossing the strait, even those with visas, may be arrested, imprisoned briefly, fined, deported and banned from future visas. The Bering Strait is about 82 kilometres (51 mi) wide at its narrowest point, between Cape Dezhnev, Chungu Peninsula, Russia, the easternmost point (167° 42' W) of the Asian continent and Cape Prince of Wales, Alaska, United States, the westernmost point (164° 15' W) of the North American continent. Its depth varies between 30 metres (98 ft) and 50 metres (160 ft). It borders with the Chukchi Sea (part of the Arctic Ocean) to north and with the Bering Sea to south. The International Date Line runs equidistant between the Strait's Diomede Islands at a distance of 1.5 km (1 mi), leaving the Russian and American sides usually on different calendar days, with Cape Dezhnev 21 hours ahead of the American side (20 hours during daylight saving time). The eastern coast belongs to the U.S. state of Alaska. Notable towns on the American coast of the Strait include Nome (3,788 people) and the small settlement of Teller (228 people). The western coast belongs to the Chukotka Autonomous Okrug, a federal subject of Russia. Major towns that lie along the Strait include Lorino (1,267 people) and Lavrentiya (1,459 people). The Diomede Islands lie midway in the Strait. The village in Little Diomede has a school which belongs to Alaska's Bering Strait School District. The earliest reference of the strait were from maps from the Polo family, based on the adventures of Marco Polo. From at least 1562, European geographers thought that there was a Strait of Anián between Asia and North America. In 1648, Semyon Dezhnyov probably passed through the strait, but his report did not reach Europe. Danish-born Russian navigator Vitus Bering entered it in 1728. In 1732, Mikhail Gvozdev crossed it for the first time, from Asia to America. Adolf Erik Nordenskiöld in 1878–79 sailed along the northern coast of Siberia, thereby proving that there was no northern land bridge from Asia to North America. In March 1913, Captain Max Gottschalk (German) crossed from the east cape of Siberia to Shishmaref, Alaska, on dogsled via Little and Big Diomede islands. He was the first documented modern voyager to cross from Russia to North America without the use of a boat. In 1987, swimmer Lynne Cox swam a 4.3-kilometre (2.7 mi) course between the Diomede Islands from Alaska to the Soviet Union in 3.3 °C (37.9 °F) water during the last years of the Cold War. In June and July 1989, three teams of sea kayakers combined to attempt the first modern sea kayak crossing of the Bering Strait. The groups were seven Alaskans referring to their effort as 'Paddling Into Tomorrow' (crossing the international dateline), a four-man British expedition, Kayaks Across the Bering Strait and an unnamed group of three Californians. In March 2006, Briton Karl Bushby and French-American adventurer Dimitri Kieffer crossed the strait on foot, walking across a frozen 90-kilometre (56 mi) section in 15 days. They were soon arrested for not entering Russia through a border control. August 2008 marked the first crossing of the Bering Strait using an amphibious road-going vehicle. The specially modified Land Rover Defender 110 was driven by Steve Burgess and Dan Evans across the straits on its second attempt following the interruption of the first by bad weather. In February 2012, a Korean team led by Hong Sung-Taek crossed the straits on foot in six days. They started from Chukotka Peninsula, the east coast of Russia on February 23 and arrived in Wales, the western coastal town in Alaska on February 29. In July 2012, six adventurers associated with "Dangerous Waters", a reality adventure show under production, made the crossing on Sea-Doos but were arrested and permitted to return to Alaska on their Sea-Doos after being briefly detained in Lavrentiya, administrative center of the Chukotsky District. They were treated well and given a tour of the village's museum, but not permitted to continue south along the Pacific coast. The men had visas but the western coast of the Bering Strait is a closed military zone. Between August 4 and 10 (US time), 2013, a team of 65 swimmers from 17 countries performed a relay swim across the Bering Strait, the first such swim in history. They swam from Cape Dezhnev, Russia, to Cape Prince of Wales, United States (roughly 110 kilometres (68 mi), due to the current). They had direct support from the Russian Navy, using one of its ships, and assistance with permission. A physical link between Asia and North America via the Bering Strait nearly became a reality in 1864 when a Russian-American telegraph company began preparations for an overland telegraph line connecting Europe and America via the east. It was abandoned when the undersea Atlantic Cable proved successful. A further proposal for a bridge-and-tunnel link from Siberia to Alaska was made by French engineer Baron Loicq de Lobel in 1906. Czar Nicholas II of Russia issued an order authorising a Franco-American syndicate represented by de Lobel to begin work on the Trans-Siberian Alaska railroad project, but no physical work ever commenced. Suggestions have been made to construct a Bering Strait bridge between Alaska and Siberia. However, despite the unprecedented engineering, political, and financial challenges, Russia green-lighted the US $65-billion TKM-World Link tunnel project in August 2011. If completed, the 103-kilometre (64 mi) project would have been the world's longest. China considered construction of a "China-Russia-Canada-America" railroad line that would include construction of a 200-kilometre-long (120 mi) underwater tunnel that would cross the Bering Strait. In 1956, the Soviet Union proposed to the US a joint bi-national project to warm the Arctic Ocean and melt some of the ice cap. As designed by Petr Borisov, the Soviet project called for a 90-kilometre-wide (56 mi) dam across the Bering Strait. It would block the cold Pacific current from entering the Arctic. By pumping low-salinity cold surface water across the dam to the Pacific, warmer and higher salinity sea water from the Atlantic Ocean would be introduced into the Arctic Ocean. However, citing national security concerns, the CIA and FBI experts opposed the Soviet plan by arguing that while the plan was feasible, it would compromise NORAD and thus the dam could be built at only an immense cost. Soviet scientist D. A. Drogaytsev, also opposed the idea, stating that the sea north of the dam and north-flowing rivers in Siberia would become unnavigable year round, and extend the Gobi and other deserts to the northern Siberia coastline. 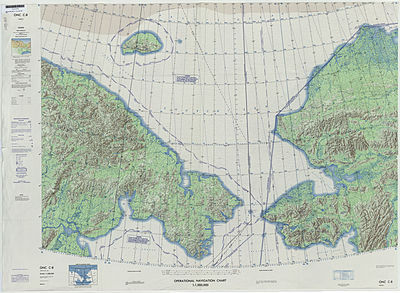 American Charles P. Steinmetz earlier proposed to widen the Bering Strait by removing St. Lawrence Island and parts of Seward and Chukotski Peninsulas. A strait 320 kilometres (200 mi) wide would let the Japan Current melt the Arctic Ocean. In the 21st century a 300-kilometre (190 mi) dam has also been proposed, however the aim of the proposal is to preserve the Arctic ice cap against global warming. 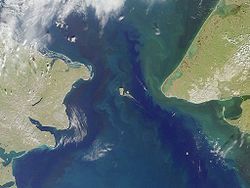 During the Cold War, the Bering Strait marked the border between the Soviet Union and the United States. The Diomede Islands—Big Diomede (Russia) and Little Diomede (US)—are only 3.8 km (2.4 mi) apart. Traditionally, the indigenous peoples in the area had frequently crossed the border back and forth for "routine visits, seasonal festivals and subsistence trade", but were prevented from doing so during the Cold War. The border became known as the "Ice Curtain". It was completely closed, and there was no regular passenger air or boat traffic. In 1987, American swimmer Lynne Cox symbolically helped ease tensions between the two countries by swimming across the border, and was congratulated jointly by Ronald Reagan and Mikhail Gorbachev. ^ Beck, Roger B.; Linda Black; Larry S. Krieger; Phillip C. Naylor; Dahia Ibo Shabaka (1999). World History: Patterns of Interaction. Evanston, IL: McDougal Littell. ISBN 978-0-395-87274-1. ^ a b Andrew Roth (July 11, 2012). "Journey by Sea Takes Awkward Turn in Russia". The New York Times. Retrieved July 12, 2012. ^ "The Victoria Advocate - Google News Archive Search". news.google.com. ^ Watts, Simon. (2012-08-08) "Swim that broke Cold War ice curtain". BBC News. Retrieved on 2013-07-29. ^ "Epic explorer crosses frozen sea". BBC News. 3 April 2006. Retrieved 13 January 2012. ^ "Epic explorer detained in Russia". BBC News. 4 April 2006. Retrieved 13 January 2012. ^ "Cape to Cape Expedition". Retrieved 13 January 2012. ^ The Korea Herald (March 2012). "Korean team crosses Bering Strait". koreaherald.com. ^ "ТАСС: Спорт – На Аляске завершилась международная эстафета "моржей", переплывших Берингов пролив". ТАСС. ^ "Bering Strait Swim – Russia to America". Facebook. ^ Vevier, Charles (1959). "The Collins Overland Line and American Continentalism". Pacific Historical Review. 3 (3): 237–253. JSTOR 3636469. ^ "San Francisco to St Petersburg by Rail! If the Tunnel is driven under Bering Strait will Orient meet Occident with Smile – or with Sword?". San Francisco Call. September 2, 1906. Retrieved April 23, 2016. ^ Thinking Big: Roads and Railroads to Siberia. InterBering LLC. 1899. Retrieved April 23, 2016. ^ Loicq de Lobel (August 2, 1906). Le Klondyke, l'Alaska, le Yukon et les Iles Aléoutienne. Société Française d'Editions d'Art. Retrieved April 23, 2016. ^ "FOR BERING STRAIT BRIDGE" (PDF). New York Times. August 2, 1906. Retrieved April 23, 2016. ^ Halpin, Tony (2011-08-20). "Russia plans $65bn tunnel to America". The Sunday Times. ^ Tharoor, Ishaan (2014-05-09). "China may build an undersea train to America". The Washington Post. Retrieved 2014-05-14. ^ a b c Ley, Willy (June 1961). "The Strait Named After Vitus Bering". For Your Information. Galaxy Science Fiction. pp. 37–51. ^ Fleming, James Rodger. "How the USSR Tried to Melt the Arctic". ^ "The Soviet Scientist Who Dreamed of Melting the Arctic with a 55-Mile-Long Dam". 25 April 2013. ^ "Ocean Dams Would Thaw North" Popular Mechanics, June 1956, p. 135. ^ "Could a 300 km dam save the Arctic?". Oliver, James A. (2007). The Bering Strait Crossing. Information Architects. ISBN 978-0-9546995-6-7. "Russia Plans World's Longest Undersea Tunnel". Daily Tech. 2007-04-24. Retrieved 2008-01-11. Chisholm, Hugh, ed. (1911). "Bering Island, Sea and Strait" . Encyclopædia Britannica. 3 (11th ed.). Cambridge University Press. pp. 775–776. Wikimedia Commons has media related to Bering Strait.